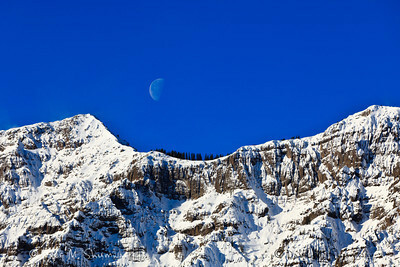 The half moon sets over Barronette Peak el. 10354 feet (3156 m) on a clear morning in Yellowstone National Park. Captured with a Canon 5D II and 70-200/2.8L IS II in aperture priority mode with an exposure bias of 0 at ISO200, f/7.1, and 1/1000th of a second. The camera was handheld. With a friend from Chicago in Montana for a visit we had to meet up and spend some time shooting in Yellowstone National Park. Lunar conditions were not perfect for a trip, but we had nice weather, good food and great company. I was fortunate enough to be the third car on a golden eagle that killed a goldeneye duck, as soon as that was finished I made my way to a bighorn ram on the cliffside above confluence. Those were the highlights of day one, other than a beautiful sunset that I photographed from above Blacktail lakes. The next morning sunrise was less than incredible and things were slow in the valley, so I decided to drive East and photograph the mountains with snow on them and pure blue sky behind. I was also hopeful that I could line the moon up for a shot or two as it was getting ready to set. Beyond that, striking out with the Lamar Canyon Pack and a quick fly by of a golden eagle at sunset the day was quite slow. Oh, but wait the day is never over just because as the sun sets clouds come racing in. I decided to stay a bit longer and my friends joined me, they foolishly thought that I might know something that they didn't. At the last possible second a little bit of the setting sunlight broke through the clouds and painted a warm glow on the clouds and mountains to the East...it was more beautiful than my photographs do justice. The best part...as we were getting back into the cars a wolf howled. Well you know me, I was going to find the wolf and get a something to share with all of you. It ended up that well after the sun had set I was able to get a few shots of a member of the Lamar Canyon Wolf Pack sitting atop a ridge in the Lamar Valley. To make the shot I had to shoot in a way that breaks many of the rules of photography I took my Canon 7D and 500/4.0L IS in aperture priority mode with an exposure bias of + 7/3 at ISO1600, f/4.0, and 1/25th of a second. The camera was only resting on a beanbag, so I laid into a long bust at 1/25 of a second and managed a few sharp images. It was dark enough that my 5D II was not able to focus, so I used the 7D and felt with noise at ISO1600. My friends were afraid to shoot at a high ISO and/or slow shutter speed, so they did not take any photos. Man were they ticked off when I showed them what I got as we enjoyed some great pizza at K-Bar. The moral of the story is it is never over until it is over, and always try to get a shot. The next morning brought plenty of snow, but not much to photograph. As the clouds cleared and the sun came out, even the coyotes stopped to take notice. The Lamar Canon Wolf Pack took advantage of the snow storm and made a kill along the Lamar River, but they were chased off of the kill by a few tourists who decided to walk down to the carcass. A few hours later the pack was ready to move back to their dinner. The leader of the "Wolf Project" decided to close the road and send folks back to their cars (those of us who listened) then after waiting a little more the wolves crossed the road to have dinner. Even with the road "closed" a few cars decided to drive on, and they got a great view of the entire pack crossing the road right next to them. A good sized group of us made our way to an overlook and watched them enjoy their dinner. It was a long ways to the carcass, so most of us photographers were really just waiting and hoping that we could catch the wolves crossing the road again after dinner, but they decided to head off to the south and away from all of us after dinner. I was set to head home, but after a night filled with okay food and great conversations I decided I should spend the night and head home in the morning. I made a quick loop into the park, but I needed to get back home to teach, so the drive home began before capturing any keepers.